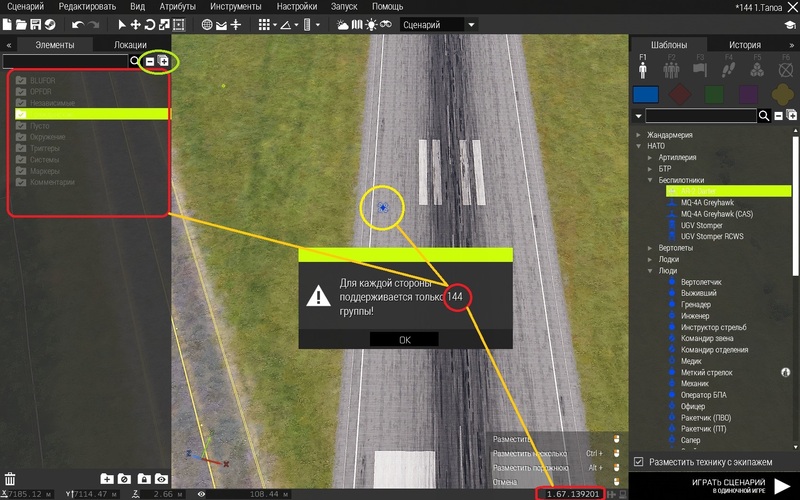 ⚓ T120533 Error of recalculation of groups in Arma3. A problem of system of recalculation Blocks creation of new group. Error of recalculation of groups in Arma3. A problem of system of recalculation Blocks creation of new group. During game many groups of players and AI are created. The problem appears after 2-4 hours of game. Possibility of creation of group disappears. Players, at an entrance on the server get, in the general group. AI don't appear which have to appear on defense of the cities. There is no opportunity to be connected to the UAV. In the city protection of VEHICLE without AI is born. Players who were on the server before emergence of a problem, can buy AI in the group. But can't create new group. If to continue to play mission, through any time, players who try to be connected to the server, speak that can't will be connected, or are in expectation of the birth (the black screen). I can't precisely tell, earlier to version 1.42 or 1.48 of this problem wasn't. Restriction of number of creation of groups in game 144 each party? In game so many groups in real time aren't created. But on everything, in 2-4 hours of game lost and killed groups lose opportunity to be used again, empty groups, something like this aren't removed. In game three parties, red, blue and green. The problem doesn't appear at once at all. At each party of group , cease to work with a gap on time 30-40 minutes at different times. Help to solve a problem. Mission of CTI. There is No Mod. Error of creation of groups in the editor. but also it is so visible that in a certain step, I lose opportunity to create more than 70 groups. I reached a limit of creation of groups, it is more than 40 I can't create. Exit from the editor, loading of the kept mission doesn't correct an error. If not to try to create the 145th group, the problem won't appear. In game the situation of attempt of creation of the 145th group isn't controlled, it leads to a problem of loss of the maximum creation of groups to 40. It brings at emergence of a problem into missions. All that I found on this matter, it doesn't help to solve a problem. Lex changed Category from Scripting to Multiplayer. would you mind posting proper link for the repro missions? The shortened link you copied unfortunately does not work. Has corrected the reference. But has faced a problem of groups in the editor. Did all actions on video in the editor (section Steps To Reproduce). In any way, there is no return of the free slot of the lost unit or the UAV. When the problem appears in a mission, I can buy the UAV, but I can't connect the terminal to it, the UAV seems not on my party, in yellow group (empty). AI won't appear in a mission (not players) where have to appear. On video I use to allocate the "left button of a mouse" groups, to copy "Ctrl+C", to insert "Ctrl+V" and to remove the allocated Del groups. On video - I have lost an opportunity to create group in the editor. Regression of creation of groups in the editor when has received the message in the editor - "about a limit in number of 144 groups". Option of receiving a problem of creation of groups in the editor. Are you able to observe same issues on the Development branch? Has played the last video on DEV. It occurs for all fractions, except rabbits. It is possible to create rabbits infinitely much. This problem is present at DEV of the version. Restriction "144" units regress in "0" units. The error of recalculation of groups in Dev is made. In Arma 3, after an error of creation of the 145th group. After this blocking, there is a problem with groups, with creation of new groups. I have tried the repro steps you provided, appears to be fine, Warning message about group limits appears only when trying to create 145th group. If you encounter the issue, please include new repro steps in the comment so I can check that out. Make actions with any number of groups = X. Rule of X=2-144. Allocate and copy groups, quantity = X. Rule X=2-144. Allocate and remove groups, quantity = with X-1. Insert the copied groups = X.
Repeat an algorithm with the remained groups. If X=2, it is possible to repeat 144 times an algorithm. Result - the number of groups =0, you won't be able to create even 1 group. Actions for bystry result on video. You are using the darters for the repro, are you able to do similar thing with infantry units? Groups of UAVs getting to yellow fraction reduce the number of the main group. It has been noticed from the very beginning. For this reason, I have shown you a problem of groups of UAVs. If in the mixed groups not to use UAVs, with calculation of groups there is no problem. But in missions UAVs are used, and there is an emergence of a problem, in the form of loss of creation of the main (living) groups. Removal of yellow groups doesn't renew an opportunity to return all 144 living groups. The mission for the editor, is only 1 group. This problem in our mission will arise not at once. More precisely, it isn't noticeable within 2-3 hours of a game. While there are living groups, all it seems well. But when vanishes, the last living group, all symptoms of a problem on a surface. Now we have reduced the number of groups which at the same time appear in the cities, on activation of the trigger. It seems gives chance to increase time for a mission, but the problem appears later. If to continue reduction of groups, emergence on the trigger, it does easy occupation of places in a game. I will be to test still as conduct groups from the operator of UAV. On DEV it is reproduced, as before. There are options of UAV group of recalculation? Issue is still in progress so no fix available yet. In the DEV EXE Rev. 139546 problem solved. Many thanks. Close the ticket.